Well, my little brother Zach has graduated from highschool. It was a welcome day for him - never have I seen such an acute case of senioritis. 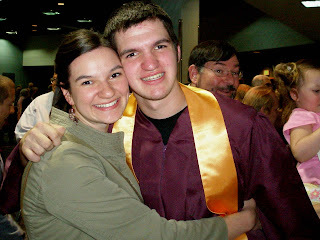 He's headed down to Guatemala for the summer on June 1st and then he heads to The Master's College in the fall. We just can't get away from that school. If you're in California this fall, keep your eye out for Zach. He's the kid with the Gates brow and the soulful eyes. Tent? Check. Fire? Check. Airplanes??? Last weekend I went camping with the college and career group from our church in Valdez (pronounced Val-Deez, I assume to disassociate the town with the failed search of Juan Valdez for the fabled fountain of youth). Valdez was having their annual bush-plane fly-in and since I happen to be friends with a bunch of planeless pilots, we thought it might be a neat thing to check out for our first camping trip o'the year. 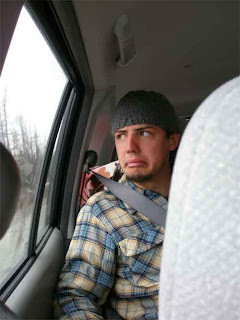 It is a little embarrassing in the Alaskan pilot subculture to drive to a fly-in, but we didn't let it dampen our spirits. The fly-in consisted of a bunch of competitions for pilots and their planes. We watched the flour bombing, where you try to hit a little target with a bag of flour while flying past at one hundred feet. Some people were off by hundreds of feet, but one guy landed his six inches from the target. They also had short landings and take-offs. The winner took off in 19 feet, which is shorter than the actual length of the plane! 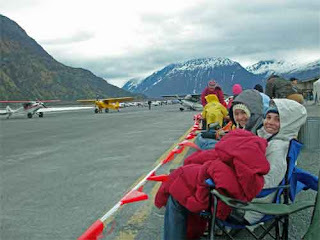 We camped right on the runway, which wasn't exactly Nature's Bosom, but was authentic nonetheless. I wish I had taken more pictures. Here's a few that I managed to snap. 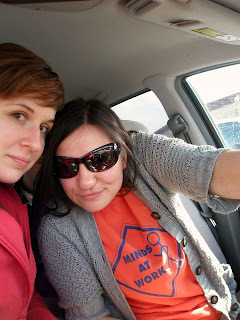 My roommate Melody and my friend Sarah enjoyed themselves despite the six-hour drive and the biting wind. New friend Stephen making a funny face. The drive to Valdez was six hours. Jannell and I paused for a picture. 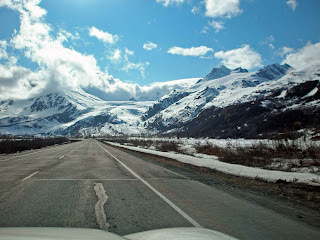 The drive is also one of the prettiest in AK and less congested than heading south out of Anchorage. P.S. If you have a juvenile sense of humor and know someone who speaks German, ask them to say "Have a nice trip." Try to ask them in a public setting like a noisy room or radio interview. P.P.S. In my research for this post, I've realized that juggernaut is Hindi and not German at all. But doesn't it sound German? So in preparation for the Big Move (or, as I like to think of it, the impending BM), I’ve commenced a little sorting of my varied and sickeningly abundant possessions. I started with vigor and a remarkable sense of purpose. I stripped my bed and stuffed my sheets into the washer with the half-baked notion that I'd be done with my room before you could say "air fluff." The vast expanse of the denuded queen-size bed sang a siren song of organization and hope for my hopelessly cluttered bedroom. So, with my iPod playing through all those podcasts that I download but never play, I pulled armloads of stuff from the floor of my closet and heaved them onto the bed. Immediately, I was hit with the first sticky-sweet wave of nostalgia. Old letters, yearbooks, mix tapes. Forgotten pictures of forgotten people. Quilts and cellphone bills and gagets that my dad gave me for Christmas. When I came to my senses, hours later, I was sitting cross-legged on my bedroom floor, the epicenter of a nostalgia earthquake. Letters and books and old t-shirts were scattered about me in a large circle of loose categories like "throw away," "return to friends," and "childhood." It’s a little painful to say goodbye to that thought-I’d-be-able-to-fit-in-it-one-day shirt from Banana Republic and the I-know-the-elbows-are-worn-out-but-it’s-my-favorite sweater that saw my through my college years. But there is also something cathartic and satisfying about going through your things and coming out a little more focused. A little more organized. A little leaner. Not that I've actually experienced the feeling, as yet. When I disembarked the nostalgia train it was well past my bedtime, and my sheets were still in the washer, fermenting. So I raked all the stacks and piles and sundries off my bed and onto the floor and I pulled my comforter up over my shoulders. I'll just have to get organized tomorrow.